Order online via our secure order page or contact us with our email form. THE SKATEBOARD HANGAR™ is the first hanger of its kind which allows you to hang your board in the closet over the clothes rod or from a nail in the wall of your bedroom or garage. 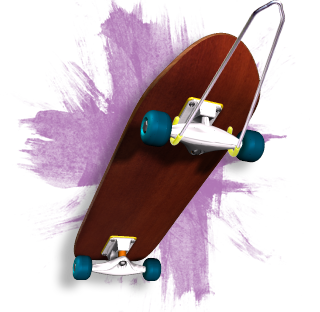 Get your skateboard up off the floor and make it a showpiece instead of a liability! When you're ready to ride, just grab your board and go! It's that easy. And it's only $7.99 each (includes shipping and handling in the U.S. For orders outside the U.S., actual cost of shipping will be added). Purchase 4 or more for only $5.99 each (when shipped together). Use your PayPal account or credit card or bank account (where available) on our secure ordering system.